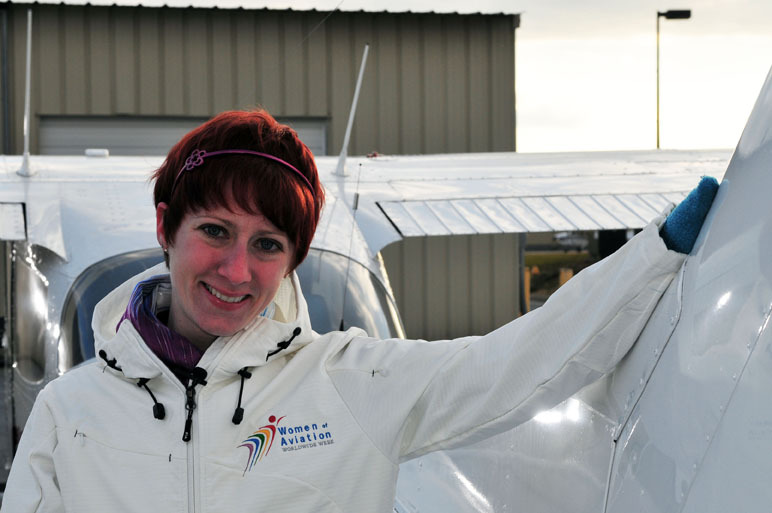 Last year, we celebrated the 100th anniversary of the first female pilot earning her license. It was around this time that I learned that only 6% of the pilots in the world are women. The number of women in aviation was never something I thought about much. I was so preoccupied in my flight training to care about the genders of the people around me. Hearing this fact got me thinking that my journey may have been a lot easier with female pilot support. How many woman pilots did I come across in my training? How many of my girlfriends did I have study sessions with? How many women did I see at the airport that I could share flying stories with or go to for advice? The answer was three. Just three women. These three women I only saw in passing and was never able to share any flying experiences with. That number stuck with me. In December of 2010, I heard of an initiative to introduce more women to aviation, it was called The Centennial of Women Pilots. I saw something amazing happen. Many girls and women were flocking to the airport to experience flight in GA aircraft. I saw pilots – both male and female – taking women and girls for flights. I saw smiles and I heard stories of women who couldn’t wait to learn more. Like me, these women dreamed about aviation and since their first flight have not been able to stop thinking about it. The Centennial of Women Pilots movement eventually morphed into Women of Aviation Week celebrating the week the first licensed female flyer receiver her pilot certificate. Events called “Fly it Forward” were to be held during this week, and I had to be a part of it. I was relatively new to the Frederick, Maryland area when I organized our local Fly it Forward event last year, and I don’t think I've ever been so worried or so stressed about the possible outcome. I had lined up 26 airplane pilots, EAA ground crew to marshal them, arranged catering donations and exhibits, even a visit by an all-female Air Force Huey squadron. 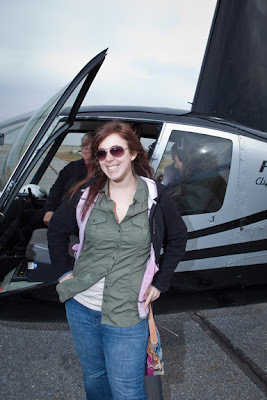 Some pilots flew hundreds of miles to take part, we even had a woman fly her R44 helicopter down from Pennsylvania to introduce other women to her favorite way to fly. It turned out that I had nothing to fear. Women and girls flocked to the airport. At the end of the day, 185 had received free flights. The event won my home base of KFDK the “Most Female Pilot Friendly Airport Worldwide” title for 2011. I know of two women who are actively pursuing their pilot certificates because of the event. It’s 2012 and naturally I have to outdo myself. This year’s event on March 10th at Frederick Municipal Airport will have many pilots willing and eager to introduce women to aviation. We’ll have tethered hot air balloon rides donated by Tailwinds Over Frederick, and special guests such as Sarah Fraher from Flying Wild Alaska, wing walking airshow performer and Stearman pilot Jane Wicker, and female members from the United States Air Force. 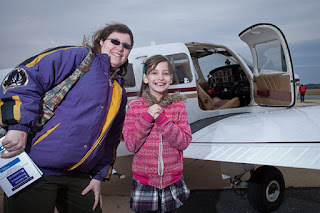 It is an event where girls and women who have never been in small aircraft before receive free plane rides, but the whole family is welcome for a day of fun at the airport- that includes the free balloon rides, too! This year my ultimate goal is different. Yes, I want as many women to come out to the airport as possible, the worldwide title the second year in a row wouldn’t be bad either, but I want one ambitious lady to come away with more than just a free ride. I want at least one woman who attends this event to have the best chance possible at earning her private pilot certificate. So I decided there would be an essay contest and luckily I found a great sponsor, Aviation Insurance Resources, to support it and a local school, Frederick Flight Center, to give the winner a discounted rental rate. This flight award will have a value of over $3000. Let’s hope this brings one future aviatrix to her first solo. One young girl who took a "fly it forward"
first flight was Victoria, right. There is just over a month until the event and I am always welcoming more sponsors, ground volunteers, and pilots. This event wouldn’t be possible without all of their enthusiastic support. Enthusiasm is contagious, especially in a world today where it seems so much harder for GA and where the total pilot population, not just the women, seems to be dwindling. Someone once told me that he believed that women could be “GA’s secret weapon” and I believe we are. It can all start with one event that could start a chain reaction. So Fly it Forward with me during March 10th! If you can’t make it to mine, find one in your area or start your own! Make sure that all women you know can say that during their flight training, they knew more than three women who were with them along the way. For more about the Frederick event visit: www.WomenFlyItForward.com or email me at WomenFlyItForward@gmail.com. To learn more about the global Women of Aviation Week visit www.WomenOfAviationWeek.org. A video explaining the Frederick Airport Fly it Forward event was produced by Len Costa of The Pilot Report and is available here. I have made the point many times that I believe AOPA Pilot Magazine is the finest aviation monthly on this planet. That's not kissing up, that's just a fact in my world. 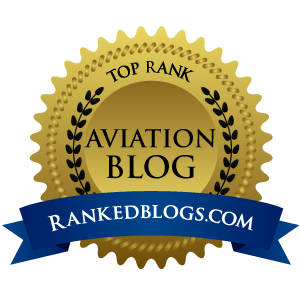 While some publications will eloquently explain the pros and cons of the latest mega-million-dollar bizjet or discuss 101 ways to use a rivet, Pilot consistently delivers the GA content welcome to aviators like me who fly single-engine piston airplanes. Much of the success of Pilot rests on the shoulders of their long-time Editor, Tom Haines. He “gets it” because he is one of us. Tom flies a Bonanza A36, and uses the plane in much the same way I use my 1964 Piper Cherokee 235...for business but also for lots of pleasure. Tom's latest Pilot column discusses the topic of choosing to buy the right airplane based on your anticipated future missions. I was prompted to write this post because I too went through this drill when choosing Katy (our 235), and think it is a vital topic worth some more verbal expansion. 10. It had to look nice on the ramp. The majority of my flights would be two adults, however with a new granddaughter, I could foresee many trips with all four seats full of souls. I planned on about a 60/40 division of business to pleasure. When I flew for business, I needed the capacity to carry sometimes 300-ish pounds of gear...yes as a photographer/videographer I do have a tendency to carry too much crap when I travel. When I use the airlines, I have to cram a minimum of gear into a carry-on backpack and roll-aboard, so this plane would set me free to load up with everything I might need on a shoot. Because you never know when the producer might call for us to add a kitchen sink to the set. The pleasure flights would be mostly around the Northwest, day trips with not much gear. Bottom line, it would be unwise to spend big money on the care and feeding of my own plane if I could not use it for business trips up and down the West Coast. So it needed to be able to sip fuel when chasing hamburgers around the state on a clear and a million day. I began looking at the different airframes. Price eliminated the Bonanzas, and useful load eliminated the Mooneys. It basically came down to Cessna and Piper, and I had quite a few hours in many variants of each. I first considered the Cessna 172 Skyhawk and 177 Cardinal, both very affordable, but neither had the full-fuel payload I needed. So I began sizing up their 182 Skylane, which delivered all the performance I desired, but came at a premium price way north of my $70,000 threshold. Next I looked at the Piper Cherokee line. I loved the way the 180s flew, they were stable, predictable, and landings were smooth due to the ground effect of those sweet and low Hershey Bar wings. While the 180 did fit much of my mission profile, the 730 pounds of useful load and 50 gallons of dead dinosaurs on board was not enough to carry four adults and their bags on very long cross-country flights. “Katy” has a payload (after 84 gals of full fuel) of 930 lbs. That is enough to legally put a 200 lb. human in every seat and they all can bring aboard 32.5 lbs. of stuff. Those four pax will travel through thin air at about 121 KIAS burning 10 to 12 GPH depending on winds. She can make it Eugene to Fresno in four hours, and has enough range to actually make Los Angeles and even San Diego, if the PIC had equal, um, bladder capacity. She came with a price tag south of my $70K number, and has been very dependable, with predictable $1,000 annuals...the last one has NO squawks. For big business trips, the 235 shines by taking me and LOTS of stuff a great distance. And for hamburger chasing, Katy sips fuel, climbs like a homesick angel at 1,500 – 2,000 FPM, and lands at 70 mph to consistently make the first turnoff. The dance one must do while deciding what airplane to buy is significant, but important. I suggest taking the list I supplied above and modifying it with your numbers and your desires. Once you have an idea of the mission, and have identified the make/model of a flying machine that will suit those needs, I strongly suggest taking your time finding the perfect airplane. Do NOT buy the first airplane you look at on impulse, because I assure you the rush of adrenaline you will feel when you begin looking at airplanes that could actually be yours will be like crack cocaine to any aviator. Be wise, be patient and be smart. Do those three things and you will have a positive love affair with YOUR airplane, one that nobody else can call theirs. And when you swing open those hangar doors for years to come, each time, you'll get a massive hit of pride, of elation, of lust. Because there is simply no substitute for owning your own airplane. Hampton Roads Executive Airport (KPVG) is a fantastic example of a thriving general aviation complex. This non-towered airport has crossing runways, full serve and self-serve fueling facilities and a recently opened $2 million, 6,300 square foot executive terminal building. Located 7 miles southwest of the heart of downtown Norfolk and having access to the interstate freeway system makes it the perfect reliever airport for Norfolk International (KORF). Steve Fox and Andy Gibbs, the principals of Virginia Aviation Associates, L.L.C., bought the airport through bankruptcy proceedings in May 2000. As pilots, these business men are committed to airport growth and improvement. Fox and Gibbs expanded from 300 acres to 634 acres, built a new terminal building and actively recruited aviation related businesses. These guys are just getting started. KPVG is currently in the process of constructing a new 5,350 foot east-west runway, converting the existing runway 10/28 to a taxiway and installing an ILS. One flourishing business that seems to be the heart and soul of Hampton Roads Executive is Karen Singletry‘s BlueSkies Grille. Over the last ten years Karen, with her daughter Lauren and son Jarred, have fashioned a relaxing and friendly place to refuel and plane watch. A recently remolded patio facing the runways contains Adirondack patio chairs, bright blue umbrellas and white picnic tables. Inside vibrant red upholstered chairs and booths give this place an urban diner look. It just feels clean and inviting. Ambience aside, patrons come for the view, the cuisine and Karen’s hospitality. Every one of the 40 seats gazes out on to the south flight line and runway 10/28. Cessna 172s, Piper Cherokees and an odd Cessna 336 in-line twin frequently pass by the window. A & Ps from Lear Steven’s Aviation next door float in and out throughout the day grabbing a piece of pie d’jour and a cup of coffee. Various hanger rats invariably stop by just to say “hi” to Karen. BlueSkies is only open for lunch and serves a simplistic diner-like menu. Four categories dominate: Soup & Chili, Salads, Sandwiches & Franks and Desserts. Barely two dozen items in total. This place isn’t about local farmer produce, pasture-raised hand massaged cows or just off the boat fish. In fact there isn’t a piece of fresh fish offered. What BlueSkies is about is executing a limited short-order menu with grace and a smile. The Lode Star Burger ($5.99), named after the WWII Lockhead C-60, is a solid ¼-pound beef patty topped with the regular fix’ns. It’s not pretentious, not fancy and not at all greasy. It is tasty. The Mile-High Club ($6.99) is an expanded version of their Turkey Sandwich ($6.49). It stacks alternate layers of sliced pre-purchased turkey and ham with crisp bacon and American cheese. The classic doesn’t break any new ground but does satisfy. The Grilled Chicken Salad ($7.29) has warm strips of grilled to order chicken breast over fresh chopped green leaf lettuce. Olives, red onions and tomatoes are nestled among the greens. Again, we’ve seen this before but somehow the bright, airy and sunny room makes it taste special. While many menu items saw a can opener, BlueSkies’ Chili ($4.99) and Soup of the Day – Chicken noodle on this visit ($3.99 - $4.99) – were definitely made from scratch. Hearty offerings but it’s what the body craves in winter. “Today’s Desserts” selections are worth the trip. On this occasion Karen offered Banana Cream Pie ($3.49) and Apple Pie a la mode ($3.99). These were not made on premise but who cares. Yummy is yummy no matter the origin. The apple was decadently, gooey sweet while the banana cream had a dense, rich custard. In a word, delicious. BlueSkies is a place you want to like and Karen and her staff make it easy. It isn’t the best diner food. It doesn’t have the widest selection of items. It doesn’t even have the best view of the airstrip. BlueSkies does have something elusive, something intangible. Call it a feeling, a vibe; a certain je ne sais quoi. Whatever you call “it”, it keeps newcomers coming and regulars coming back. Lights: Dusk-Dawn, ACTVT MIRL RYS 02/20 & 10/28 - CTAF. As a hangar resident of Eugene, Oregon's KEUG (Mahlon Sweet Field), I have watched as the City of Eugene constructed the airport's new Station 12 literally about 50 paces from my hangar door. And even though the station is up, running and fully staffed, I had yet to walk over there and say hello. 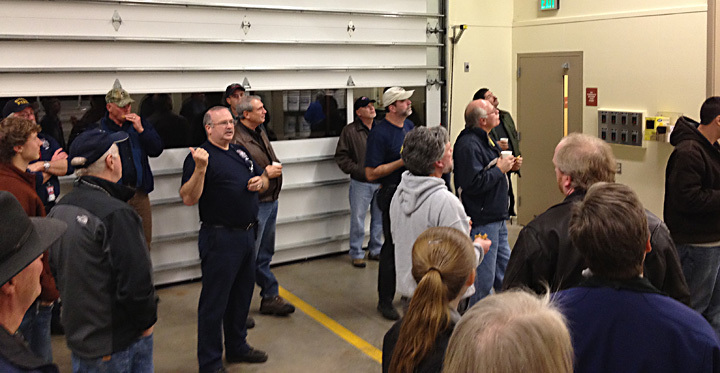 So the recently January meeting of my EAA Chapter at the station was a highly-anticipated event. The meeting was the first for our new club President, Bob McManus, who also happens to own the Jabiru parked next to my Cherokee 235 in our large group hangar. Bob really got his tenure off to a roaring start by arranging the firehouse meeting, which ended up being extremely productive for both the pilots and firefighters. Prior to a tour of the new facility – which earned a LEED Silver Award – the EAA members packed the station's conference room for a very informative session aimed at education in both directions. The firefighters were interesting in learning specifics of GA airplanes while also helping the EAA members to better understand how their station functions in an emergency. The presenter at Monday’s meeting was Engineer Linn Burch. He is a line firefighter/paramedic, with the rank of Engineer, which means he is an apparatus operator. He is coordinating training for the City of Eugene's Aircraft Rescue and Fire Fighting (ARFF) team. The ARFF-certified firefighters who crew the station consistently earn A+ ratings in their FAA evaluations, and they can tell you precisely where system shutoffs are on each commercial airplane that services KEUG. But they pointed out there was “very little” specific training aimed at GA airplanes. Two such specifics discussed were the ballistic rockets used not only on Cirrus airplanes but also many ultralights and Light Sport models, and also best practices for accessing a tightly-cowled composite experimental engine compartment that is on fire. Also discussed was the possibility of notifying the fire station when an experimental airplane was about to make its first flight, or even light off a new engine for the first time. Since many builders call the tower before a first test flight, the firefighters said a call from ATC to their station via a direct line would be easy to coordinate. 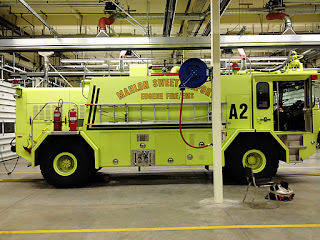 When asked about being on hand at a member's hangar when starting a fresh engine, one firefighter said their crew were “like sponges” as they learned new ways to serve the airport community, and that seemed like an easy thing to coordinate. Lots of discussion was spent talking about when to declare an emergency. The fire guys and an ATC controller in the audience agreed that we should “declare early” so emergency crews can be as prepared as possible. One point made by former United Captain and EAA 1457 member Phil Groshong drew muted chuckles from the crowd when he said the "worst time to declare emergency is after you crash." Makes sense to me. After the official meeting, it was on to the tour, which was quite cool, if you love gigantic fire trucks (who doesn't?). 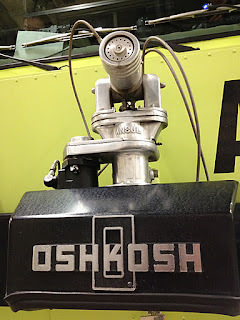 We saw how the crews live, eat, relax and work out in the on-site gym, but the real star of the show was the 1991 Oshkosh T-1500 truck at center stage in the main equipment bay of the station. Painted in fantastic day-glow yellow, this particular Oshkosh fire truck carries 1,585 gallons of water, 205 gallons of AFFF foam and 700 pounds of “purple-k” dry chemical. Any of this can be dispensed RAPIDLY through a roof turret rated at 375-750 gallons per minute or a bumper turret that delivers 300 gpm. This however is not the biggest, baddest truck in the Station 12 fleet. In the shop on the day of our tour is their 2004 Oshkosh Striker, which is larger and has more capacity than the T-1500 we saw. After taking turns sitting in the “flight deck” of the T-1500 enjoying a panel that has enough switches and steam gauges to make any aviator smile, we toured the “Disaster Trailer” which is a Wells Cargo rig stocked with 100 backboards, patient movers (rugged large-wheel gurneys), medical triage boxes, IVs and Oxygen. Overall, this session brought the two communities of the airport together. We EAA members learned about how the station operates while the fire crews got to ask specific questions about the airplanes we fly. Many in attendance predicted that this new collaboration will continue and grow as we aim to help the firefighters who help us when needed. 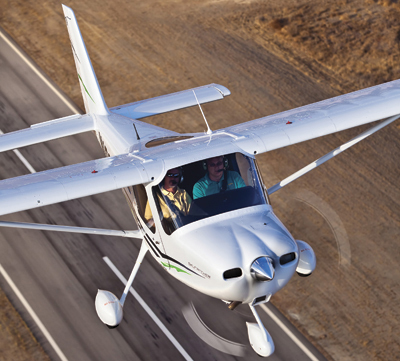 Six Great Private Pilot Training Programs in the U.S.
Editor's note: This guest post is one of many we hope to publish on the Airplanista aviation blog. If you have a completed story or post, we'd love to review it for possible publication...please email it here. There are hundreds of flight schools located across the United States, many of which offer great instruction. When searching for an aviation training school, you will want to make sure the school you choose is the best for your needs. First off, if you are seeking a private pilot license, make sure you are looking for a school that caters to this type of student. Some aviation schools only offer instruction for commercial pilots. In addition, research whether the school operates under Part 61 or Part 141 of the Federal Aviation Regulations. Available aircraft fleet and cost of the program should also be taken into account. To verify the credibility of the school, contact your local FAA Flight Standards District Office, Better Business Bureau or Chamber of Commerce to check the school’s safety records and business practices. Listed below are six great flight training programs in the United States. By no means are these the top programs. However, they are the better programs in their respective locations. If you do not live near any of these schools, contact your local airport or community college to inquire about any recommended flight training schools in your area. Flying Tigers in Houston, Texas: Associated with Lee College in Baytown, Texas, the Flying Tigers flight school offers top rate flight courses and training at a great price. A wide variety of aircraft types are available to give you the opportunity to learn the most about visual and instrument flight rules. Dean International in Miami, Florida: Earn your private pilot or commercial pilot license at one of the most prestigious flight schools in North America. Dean International has 35 aircraft in their fleet and has educated more than 6,000 pilots from all over the world. Flight Safety International: With 40 learning center locations across the world, Flight Safety International is one of the leading aviation training companies in the industry. The company’s headquarters is in the United States, and most of its training centers are located in the U.S., as well. In addition to private and commercial pilot training, they also offer maintenance technician, flight attendant and dispatcher training. Connecticut Flight Academy in Hartford, Connecticut: This school operates out of the Hartford Brainard Airport (KHFD). Because the school is so closely located to some of the world’s busiest airports (New York and Boston), students are well-trained in operating aircraft in high traffic areas. Aviation Professionals Incorporated in Chicago, Illinois: Operating out of Chicago Midway Airport (MDW) this flight school boasts itself as one of the oldest flight training schools in America. Training is offered for both private and commercial pilot licenses. Alliance Flight Schools in Scottsdale, Arizona: Instruction is one-on-one at this training center that operates out of Scottsdale Municipal Airport (KSDL). Standard and accelerated courses are offered for earning your private pilot license. Courtney Henderson is writer and editor for Airport Management Degrees. In her spare time, she likes to write guest articles for various websites on various topics of interest. I have made the point many times that quite possibly the finest news source for monthly aviation news is Aviation International News (AIN). While other more frequent publications like General Aviation News and Pacific Flyer have GA issues covered very well, and while AOPA Pilot Magazine succeeds in raising the bar each month for glossy aviation magazines, nobody reports aviation in-depth like AIN. Their reporting on all elements of our aviation world is stellar, and one of those reporters who seems to consistently crank out much of this fascinating content is AIN's Matt Thurber. Recently, Thurber posted a quick survey online and I am asking my readers to quickly go here and help Thurber and AIN by taking one minute to participate. Thurber made this really easy for you by having everything on one quick page. It is short, concise, and will provide vital input on an important topic. AIN's Pilot Training and Professionalism Survey has just five questions, so please drop what you are doing right now and invest sixty seconds in helping this reporter obtain some info for a future piece. If you have questions, feel free to contact Thurber via email here. It is quite easy during the first few minutes of a commercial airline flight to all but ignore the Flight Attendants (FAs) asking you – nicely – to take your seat and stow your stuff. We spend the next few moments avoiding the safety briefing, cocky as we are, thinking we already know how to fasten a seat belt, what more do they need to tell us anyway? Oh yeah, the exits, yada yada, flotation devices blah blah. But try as we do to ignore FAs, funny how we travelers will quickly push that call button the second we need something. Soda not cold enough? Push the yellow button. Pretzels just a tad too stale? Yep...yellow button. FAs get nowhere near the respect they deserve. They are a vital, highly-trained member of every flight's crew, and I can assure you, when the call goes out that an emergency is on board, any FA on any carrier will know what to do. The lives these people lead are interesting at best, and chaotic at worst. If it possible for them to enjoy a somewhat normal life with family, home and hobbies, but they spend many nights alone in a crash pad or hotel room with time to kill. 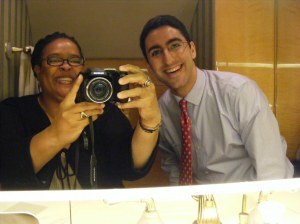 How FAs fill that time varies, but two that I know pull out their laptops and write really fantastic blogs and books. Sara's blog is hip, upbeat, colorful, and reads very well. It's a very good example of how we bloggers do it right as she keeps it lively, fresh and relevant. How she does this on the go with a career and family at home is just shy of a modern technomiracle. Another FA that writes a very good blog (and upcoming book) is Heather Poole. 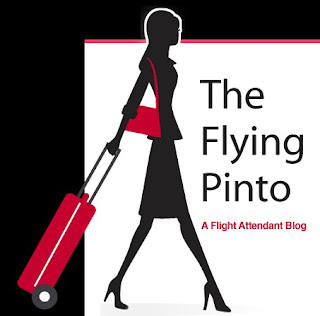 Her Another Flight Attendant Writing About Flying blog has almost endless content, all which pulls back the curtain on her life as an FA. Flight attendant buddy passes - do you REALLLY want one? Gifts for flight attendants - and travelers! of a Gulfstream once owned by Oprah Winfrey. If you know of the phenomenon know as Laviating then you've been to Heather's site. Here you'll find numerous self-portraits of people taken in Lavs around the globe. These are just two of the MANY Flight Attendants who write about their profession. You might be served by one of them on your next commercial flight. So you are hereby warned that if you choose to do something stupid, irresponsible, crazy, whack, or flagrantly stoopid on board a scheduled flight, the chances are higher than you realize that the smiling person in the uniform asking you politely to STFU and take your seat might well be taking notes for their next blog post.